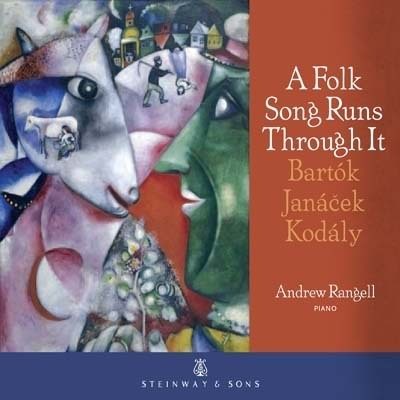 "The folk origins of Hungarian and Czech piano music are the subject of this fascinating new album by pianist Andrew Rangell. Renowned as an interpreter of Bach and Beethoven, the pianist here turns his gaze on Bartok, Janacek and Kodaly, exploring lesser-known works and taking care to showcase how broad and powerful was the influence of folk song...the most intriguing offering is Bartok's "Improvisations on Hungarian Peasant Songs." The piece with the most direct link to folk music is also the furthest ranging, full of odd turns and biting dissonances that in Rangell's hands sound as fresh and unpredictable as if they were penned yesterday." A Folk Song Runs through It follows Andrew Rangell’s acclaimed 2012 release for Steinway, Bach’s Art of Fugue. With this release, Andrew Rangell, known for his eloquent interpretations of Bach and Beethoven, reminds us of his breadth of repertoire and thoughtful, stimulating programming.